We believe building resilient infrastructure requires a comprehensive and collaborative approach which involves a broad range of disciplines such as engineering, business, social science, and public policy. By integrating the findings of different disciplines we can gain a better perspective on the influence of natural and man-made hazards on infrastructure. Recently, a multi-hazard simulation framework has been developed at Carleton which includes experts from a wide range of disciplines and allows sharing computing and laboratory facilities between multiple research institutions. Being part of this unique simulation framework enables our research group to work closely with experts from other research areas and have access to their databases and models. We believe by incorporating our results into behavioural models developed by other disciplines, we can understand the impact of infrastructure resilience on communities and societies to a level which has not been achieved to date. Significant amount of research has been conducted to develop advanced analytical models for reinforced concrete elements. One notable achievement was the formulation of the Modified Compression Field Theory (MCFT), a well-recognized rational model that serves as the basis for many finite element programs as well as various design codes worldwide. A second major achievement was the development of the VecTor suite of nonlinear analysis programs, based on the MCFT principles. 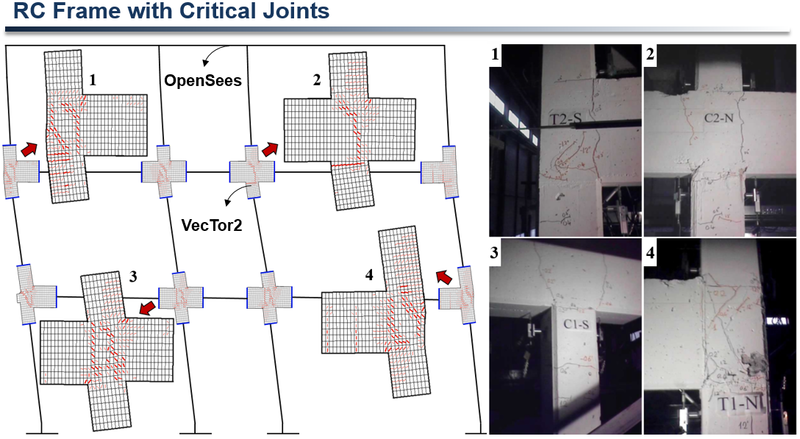 MCFT considers cracked concrete as a unique orthotropic material with its own constitutive relationships and allows the crack direction to gradually reorient depending on the material response and loading condition. Over the years, many advancements have been incorporated into the MCFT and VecTor while their fundamentals remain unchanged. Our goal is to improve the model and analysis software by developing new constitutive relationships, accounting for more behavioural mechanisms, and implementing robust and computationally efficient analysis algorithms. 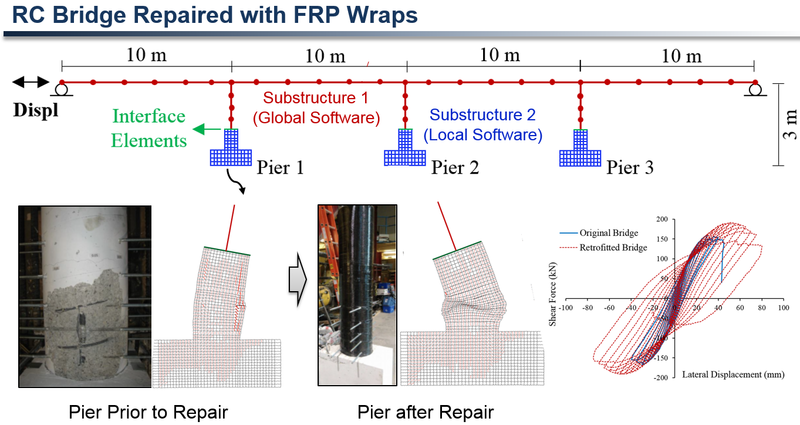 Additionally, we aim to extend the model and analysis software into state-of-the-art research areas such as behaviour of repaired structures, modern concrete materials, and extreme loading conditions. Despite the great improvements in numerical methods and computing technology, there is no analysis software that can perform well for all types of structures and loading conditions. Each analysis software has its own advantages and disadvantages and is only suitable for certain types of problems. Multi-platform simulation is a novel modelling technique which enables combining different analysis programs based on the concept of substructuring. In this approach, each critical member of the system is modelled in detail using the most suitable local analysis tool, while the remainder of the system is modelled with a computationally fast global analysis software. A simulation framework combines all substructure modules and fully considers interactions between them by satisfying the equilibrium and compatibility requirements. The effectiveness of the multi-platform analysis method has been assessed using a wide range of case studies (see below for some examples). It has been shown that this new method computes the local and global behaviour of complex structures with a level of accuracy that was previously difficult or impossible to achieve with conventional single-platform analysis software. Experimental testing is essential to gain insight into behaviour of structures as well as for calibration and verification of analytical models. However, due to limitations in laboratory space and equipment, preparation time, and cost, experimental studies are often conducted at a small-scale or at an element-level which may raise questions about their reliability. Hybrid (numerical-experimental) simulation is a unique testing technique which enables to assess the behaviour of the entire structural system in an effective and economical manner. 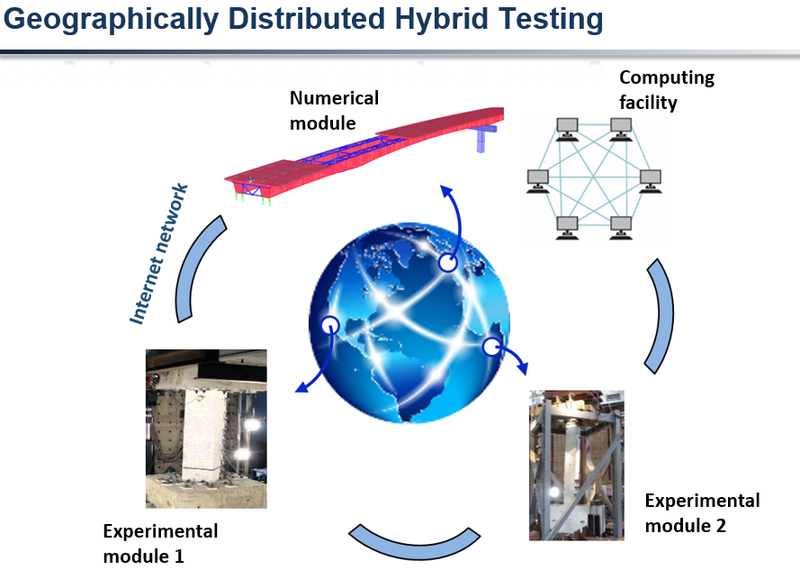 The basis of hybrid simulation is to predict overall structural displacements by computer software and impose them on critical elements represented as physical test specimens. The displacements are calculated based on the external loads, inertia and damping characteristics of specimens, and the measured restoring forces. Using a computer simulation allows one to consider the dynamic characteristics and the influence of other structural members on the response of the test specimens. 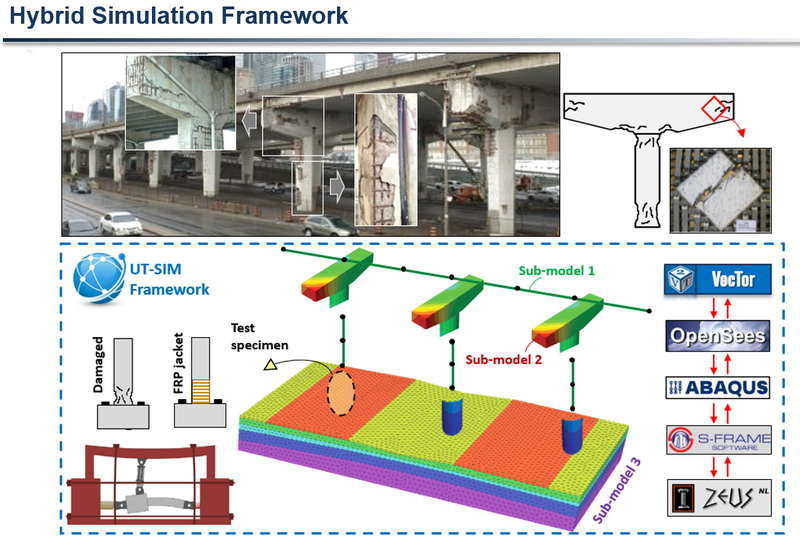 The multi-platform simulation framework developed by our research group (Cyrus) has been extended to combine numerical modules with experimental modules to accommodate hybrid testing. 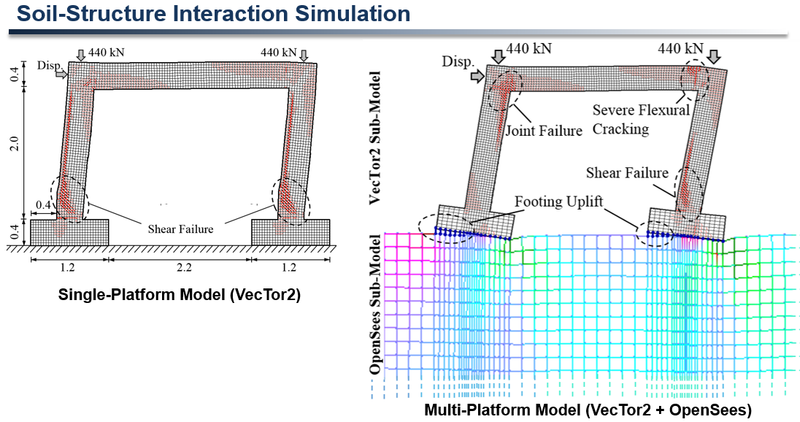 The simulation framework was verified at the University of Toronto by hybrid testing of small-scale RC frames using a 6-DOF hydraulic testing facility. At Carleton, our structural laboratory has been recently enhanced to equipment with hybrid testing capabilities. One of our objectives is to employ this unique testing technique to evaluate the performance of concrete structures in a more realistic way. Additionally, our research team is collaborating with the UT-SIM research group from the University of Toronto to initiate geographically distributed hybrid simulation which enables to share computing resources and laboratory facilities between different research institutions through the Internet network. it considers the economic and societal impacts of infrastructure performance through collaboration with other disciplines. it uses well-recognized rational models to predict the behaviour of reinforced concrete. it enables to incorporate a diverse range of behavioural mechanisms and loading conditions. it fully considers both local and global behaviour of structural systems. it enables to integrate a broad range of finite element analysis software. it does not rely on commonly used assumptions, material characterizations, or analysis calibrations. it has been extensively verified against experimental results reported in the literature.